Welcome back to Open Mic Mondays! There’ll be a few of these in a chain, as I carve time out to update the blog regularly and first out of the gate is my friend Wabbit. A fellow former SFX blogger, she’s a relentlessly hard working, generous human, one of my martial role models and a profoundly excellent cosplayer. It’s that last that’s the basis for this piece so, without further ado, over to you, Laura. Once upon a time, I thought I had mixed feelings about hefty cosplayers. Once upon a time, I felt a little conflicted about this “issue” that occasionally causes people to either grow uncomfortable or make snarky comments. Once upon a time, I wanted to stand up for my fellow cosplayers, yet somewhat understood the unease that they sometimes caused. I thought I saw both sides of this proverbial coin. Because let’s be fair. Weight is a taboo issue. It makes a lot of people uncomfortable. And no one really wants to see a 300-lb Spartan running around. That’s a lot of skin. At the same time, though, there’s something to be said for the kind of bravery it takes to be that 300-lb Spartan or that plus-sized Codex. I can’t help but applaud those cosplayers for throwing self-consciousness out the window and just putting themselves out there. Heck, I’m fit and I have a hard time wearing some cosplays in public. I’ve only recently managed to wear something tight, and one with more-than-the-usual skin showing? Nope. Not for me. I’m just not wired that way. But for those that are, why shouldn’t they choose whatever cosplay strikes their fancy? Why should they let society tell them what they should and should not wear? My gut told me that they should wear what they want and that they shouldn’t let societal expectations boss them around regardless of their weight, but I’m ashamed to say that in a recent conversation where this came up, I didn’t say that. Not just then. I held my tongue to keep the peace, but it turns out that I shouldn’t have. Because the conversation stayed with me and when friend and I talked about it later, my opinions on this suddenly fully solidified. Turns out I don’t have mixed feelings about it at all, and my feelings can be summed up thus: It doesn’t matter if someone’s cosplay makes you uncomfortable. It doesn’t matter if you don’t like it. Why? Because it’s not about you. People cosplay for a myriad of reasons, but I can guarantee you that one thing never enters a typical cosplayer’s mind when choosing their attire: you. Yes, that’s right. I hate to burst your self-important bubble, but you simply don’t matter to most of us. I know there are people who cosplay merely for the attention and the photos in hotel lobbies (although frankly, I suspect even professional cosplayers still do it for the love deep down), but for the vast majority of us, cosplay is merely an extension of ourselves. It’s our art. It’s an expression of the love we have for something. And that is a very sacred thing between us and it. You don’t enter into the equation. I can honestly say that I’ve never once thought about you when I’ve spent months making my costume or days hunting down the perfect accessory for it. And though every cosplayer out there would use different words (if they can find the right words at all, because it’s a nebulous thing, the why of it) to describe why he or she cosplays, one thing is for certain, and that’s that we do it for us. 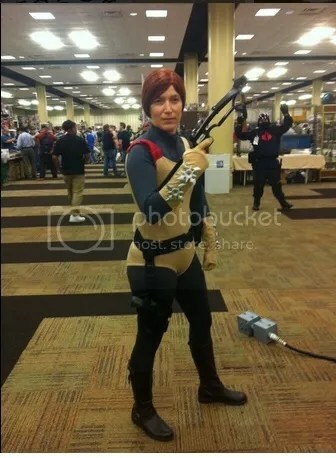 And though I know many people who say things like, “I’d cosplay Link if I was petite enough,” or “If only I was skinnier, I’d make a Black Widow costume,” there are other folks out there who do Link on a literally grander scale or a middle-aged Black Widow, and I have nothing but respect for them. So, to those of you who might be put off by plus-sized cosplayers: I say get over yourselves. And follow that age-old bit of advice that I hope your parents taught you: If you can’t say something nice, don’t say anything at all. And this applies to every way of saying something, by the way. Keep your mouth shut when at the con, and don’t make nasty comments online, either. A while ago, I saw some pictures of a heavier (though by no means obese) woman in a tight (though not revealing at all) costume online. She was being picked on in a forum. That is unacceptable. That is the act of a coward and a troll, and it deserves nothing but contempt. Of course, I had to smile quite a lot when the woman’s husband turned out to be on said forum and came forward defending his wife. The perpetrator shut up pretty damn quick, let me tell you. Seriously, those trolls truly are cowards, and the cosplayers here are heroes. And to my fellow cosplayers, I say that if you struggle with your weight, that’s okay. It really is. We all have our burdens to bear. For those of you who still get out there and do your thing, good for you! I hope no one belittles you for that, because you don’t deserve it. And for those of you in that other group? The group who wants to cosplay so-and-so but just doesn’t think you have the right shape for it? That’s okay, too. Do what you’re comfortable with. And if you want to get fit to get into that cosplay you want to do so much, go for it! But do it for you. That’s a great motivator, and you’re not alone. There are several cosplay communities (Drop by DragonCon, Fit 2 Cosplay, and many threads on cosplay.com, for example) that can help you with this. Do it because you have a goal. Do it to be healthier. Don’t do it because some douchebag with a loud mouth might make you feel bad at a con. Most of the people who would say something wouldn’t be brave enough to do it to your face anyway, and so screw them. Besides, if they have a problem with your weight, it’s their problem, not yours. End of story. So if you do ever cosplay (heavy or not), know that, like every cosplayer and other creative who puts their work out there for the public to view, you are a brave soul. Keep wearing your cosplay with pride, because it’s an extension of you. It’s art, and it has merit and value, just like you. Thanks once again, Laura. You can find her online at wabbit89.